That’s the message students are sending Al Gore, radical climate campaigners and assorted other bohemians, grant-seekers and profiteers cashing in on the global warming craze. Al Gore is calling on folks to make September 14th a day of climate action through a series of propaganda videos he will be broadcasting worldwide. CFACT calls for a day of genuine “climate realism” instead. CFACT Collegians are spreading the word with a bit of online levity. CFACT’s Methane Madness game trains online players to help “Pal Gore” control the climate by corking cows and watching them float away. Methane is more potent than CO2 as a greenhouse gas but less than 1% of atmospheric greenhouse gases come from cattle. Even so, radical climate campaigners call for shutting down our cattle and dairy industries along with much of the rest our economy. They’d like us to go vegan. However, climate science IS NOT SETTLED; computer models are not all that; observations don’t fit the models; man’s impact on climate and atmosphere is dwarfed by nature’s; Climategate is just the tip of the corrupt science iceberg; more scientists find the courage to match their analysis every day and declare against the scare; offsets are a scam; alternative energy is inefficient; citizens can now spot warming propaganda; economies in crisis can’t afford the waste; carbon profiteers rake in tax dollars but don’t affect the climate; consensus is not science; there has never been a consensus; freedom and prosperity are the proven path to cleaner environments; our meat and dairy industries are home-based, thriving industries that feed multitudes and employ the nicest people you’ll ever meet; developed nations have enough to eat for the first time in history; etc; etc; etc; etc…. If they succeed in corking all the cows, Methane Madness players can move on to further levels and put a cork in Gore and company’s hot air. Don’t worry, CFACT’s always been about free speech. Corks come out. 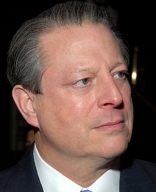 Gore and his celebrity buddies can go right back to spewing their hot air. It will take cold facts for realism to triumph over alarmism on climate. CFACT wouldn’t have it any other way. 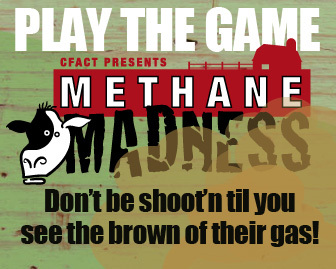 Methane Madness is available to play online at www.MethaneMadness.com. If levity’s not your bag, there’s always plenty of global warming facts and analysis debunking the scare here at www.CFACT.org and at www.ClimateDepot.com.